An ancient githyanki stronghold is ripe for the picking--or is it? A D&D adventure for 13th-level PCs. This adventure supports the new Stronghold Builders Guide. He fights, he burns. What else is there? A D&D Critical Threat. Its never too late to savor the sweet taste of revenge. A D&D adventure for 1st-level PCs. This adventure supports the new novel The Savage Caves, by T.H. Lane. A restless spirit pleads for a troubled soul to mend his ways. A D&D Side Trek for 11th-level PCs. Can the city of Redshore be saved from utter destruction? A D&D adventure for four 20th-level PCs. This adventure is your gateway to Epic-level play. 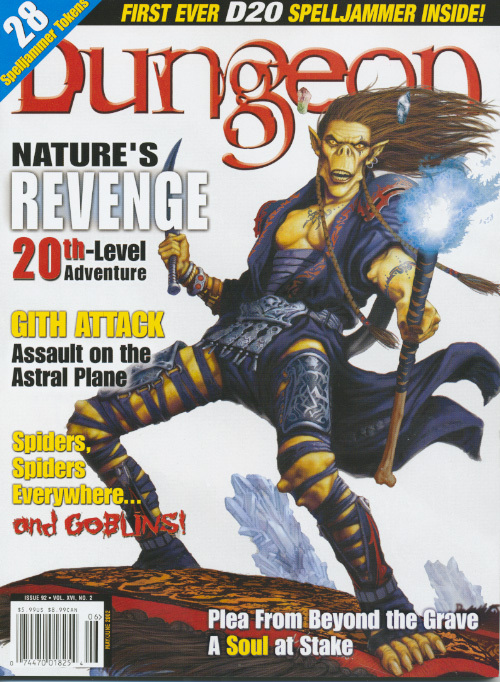 firstly i like to say that i had orignally only gotten this issue for the spelljammer article, but also as i look over it again and agian. i find that this issue has so much more to add to anyones campain or for just a good read. 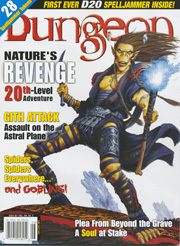 Sign in to start a discussion about Dungeon Issue #92 with Polyhedron #151!